The Engine Room fight team and trainers will be demonstrating boxing fundamentals at the BASH, providing younger audience members the opportunity to safely learn and practice basic boxing skills. 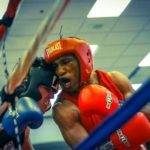 Aaron Sloan opened the Engine Room Boxing Gym in Tulsa’s Pearl District in 2015, offering both competition and fitness training. Sloan is a registered cardiac nurse, president of the Oklahoma Local Boxing Committee, vice president of the Kansas-Oklahoma Golden Gloves franchise, a USA Boxing certified coach, judge and referee, and a certified 1 Star AIBA boxing coach. He also developed the Ready to Fight Parkinson’s Specific program in 2016. Sloan offers group and individual training for people with Parkinson’s disease from the Engine Room Wellness Center in Tulsa.